You don’t want to spend too much on a multimedia project and still need a decent product? AomeTech has come up with a low cost LED projector for you. The latest AomeTech UC30 100” HD projector is one of the cheapest LED Home theater projector available in market today. This model comes with decent specification suitable for a small sized home cinema setup. The product has got mixed response from its users. Does this LED projector make out against other premium models? Should you buy this cheap product or spend little more and go for branded LED projectors? We answer these questions and more in our AomeTech UC30 Review. Image size up to 100 inches with HD resolution of 1920 x 1080, 150 Lumens brightness and 500:1 contrast ratio. Portable LED projector and works on 12V DC power backup also. 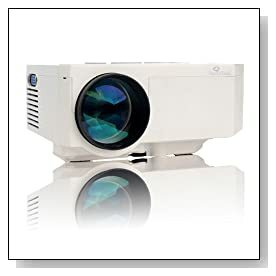 One of the cheap LED projectors available today. AomeTech has three products in market viz. UC30, UC40 and P3001, UC30 being the least priced. The model has got very basic specification targeting newbie home theater enthusiasts. AomeTech UC30 projects image size up to 100 inches with decent quality. You could easily connect this projector to media players, laptop and tablets through HDMI and VGA input ports. You can also play media files stored on SD card and flash drives. It supports all most all kinds of media file formats including DivX and Xvid. One of the selling points of this model is its low power consumption, this LED projector runs on a portable 12V DC power backup. This LED projector supports resolution of HD 1920 x 1080 with 150 Lumens brightness and 500:1 contrast ratio. 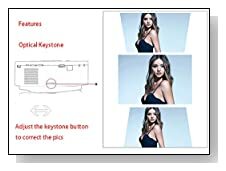 The model has 150 Lux brightness, which is not so good compared to other expensive models but was sufficient for a small and dark room. We played few movies and slide shows to test the projection quality. The aspect ratio can be set to 16:9 which is good for watching movies. HD videos looks decent on the screen but we were not very impressed with sharpness of texts. Considering the price tag, this model is a good bet for watching high definition movies on a slightly bigger screen than television. With AomeTech U30 review unit we received full functional remote control, user manual, 3 in 1 AV cable and a power adapter. The device is very light but feels sturdy and durable. Overall, this model is suitable for someone looking for a first LED projector to watch movies and television programs on a bigger screen. Price of this product will surely doesn’t put hole on your pocket and makes this model best choice to try out as first home cinema projector. However, if you can stretch your budget, we recommend to check out other projectors we reviewed earlier.